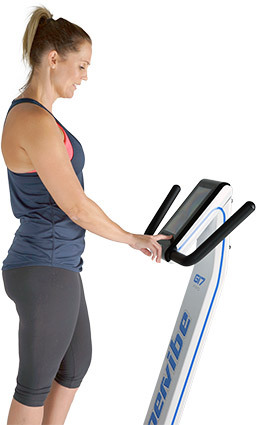 With a suitable machine and correct technique Whole Body Vibration can stimulate the body in a variety of unique and beneficial ways not possible with other forms of exercise. Research confirms that a number of direct effects on the body are possible. The type of machine and the settings used to determine the degree to which you experience those effects, if at all. 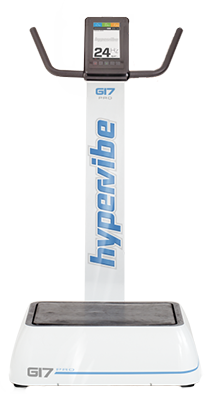 A Hypervibe machine is one of very few machines with the right combination of power and features needed to generate these effects on your body in a significant way. 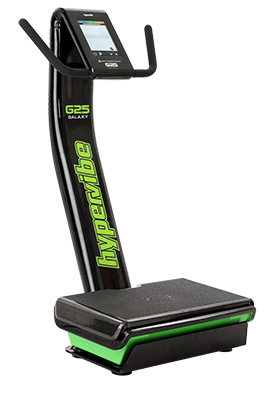 The key to Whole Body Vibration effectiveness is G-force. A review of the research literature indicates that insufficient G-force is the #1 reason for disappointing outcomes in many if not most cases. Not all Whole Body Vibration machines can generate these effects on the body to a significant degree, in fact, most cannot. Read the rest of this page to find out why. 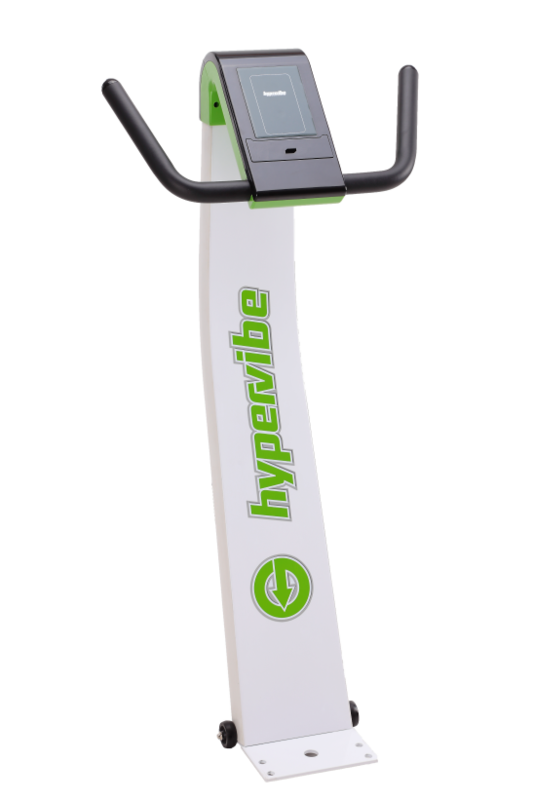 When you stand or place other parts of your body on Hypervibe’s moving platform, the repetitive upward movement of the platform sends pulses of kinetic energy up through your body. You control the strength of these energy waves using the machine’s control panel. As each wave moves up through your body some of the energy is absorbed by the tissues of your body and is converted to heat. Muscles and joints feel and operate better when they are warm. Whole Body Vibration has been proven to create a warming effect in muscles and joints faster and easier than other types of exercise. The upwards movement of the platform also causes movement in the joints of your body which has a mobilising effect and causes the muscles and tissues surrounding the joints to stretch and vibrate. Your brain is constantly monitoring the position of your joints and will increase muscle activation in an attempt to stabilise your posture when there is a risk of you becoming unbalanced. Further, if the stretching and vibration of tissues is sufficient, microscopic sensors inside your body detect these changes and quickly activate reflexes that cause the muscles to contract 1, keeping joints and soft tissues protected from excessive movement. 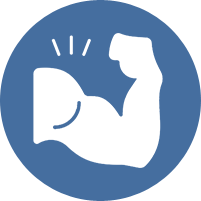 The strength of muscle contraction depends on the strength of the energy pulse coming up from the platform and the health of your nerves and muscles. Repetitive pulses of sufficient energy cause rhythmic muscles contractions. In a short time, the cumulative effect of exercising warms 4 and mobilises the joints and muscles 1 as well as the increased circulation caused by muscle pumping5, leaves you with a pleasant feeling, makes movement easier and prepares the body for working optimally. The Frequency of vibration is a measure of how many times the platform moves up and down each second. 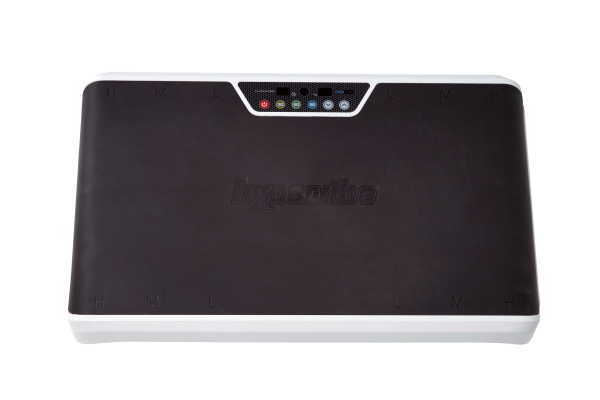 For example, a Hypervibe G17 PRO machine has a minimum frequency of 5Hz (five times a second) and a maximum of 35Hz. NOTE: Many Whole Body Vibration Machines either do not display the frequency of vibration or display inaccurate, lower than expected readings. 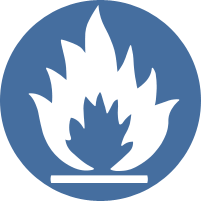 Download the FREE WBV MACHINE REVIEW REPORT to see the real output of 41 vibration machines as tested by independent engineers. Higher frequencies generate a faster platform movement and deliver more energy to your body however the way that muscles respond to vibration stimulus is complicated. The frequencies that are best for YOU to train with will depend on your body type, your level of fitness and your desired outcomes. While setting an optimal vibration frequency appears to be highly individualized, one thing is very clear; scientists commonly choose to use frequencies between 20-45Hz in their research. A review of Whole Body Vibration research by veteran researcher Jorn Rittweger 6 revealed that all studies showing positive training effects used frequencies of 20-45Hz. It is also important to consider the vibration amplitude before determining if a certain frequency range is appropriate for your goals. If the amplitude is too low, altering the frequency will make little difference. Along with frequency, the amplitude of the plate movement is also a key factor that determines how much energy is delivered to your body. Amplitude is a measure of how high the platform moves above its horizontal resting place. The total distance a platform moves up and down is called its peak-to-peak Amplitude or its Displacement. Larger amplitudes cause a greater amount of movement of muscles and joints and generate a stronger response from the organs controlling muscle reflexes. If however, the amplitude became so large that it caused you to bounce up and down off the platform, the exercise would become ineffective. Small amplitudes are more comfortable for doing upper body work on the platform however they will reduce the stimulation to your body and for lower body work could render the exercise ineffective. You should exercise with the largest amplitude you feel comfortable with. As decades of research with Astronauts has revealed, Gravity is vitally important for the health of your muscles, bones, cardiovascular and practically every other system of your body. You may never visit the microgravity of space but even here on Earth, the same ‘gravity reduction’ occurs when we sit or lie down. According to NASA, prolonged sitting closely resembles being in microgravity and has the same outcome; accelerated aging. The good news according Dr. Vernikos is that this is reversible. When Astronauts return to full gravity their health returns. Similarly when people who spend too much time avoiding gravity by sitting get up and expose themselves to full gravity, they get stronger and healthier and this includes the elderly. Whole Body Vibration is a unique way of increasing your exposure to gravity.2 The upward movement of the platform causes the body to accelerate upwards. Imagine the example of standing in an elevator. If the elevator was to move downwards at high speed it would make you feel light, almost like floating. If however it suddenly slowed to a stop and immediately moved upwards with rapidly increasing speed it would feel like your body just became a lot heavier and you would have to push down with your legs to keep yourself upright. 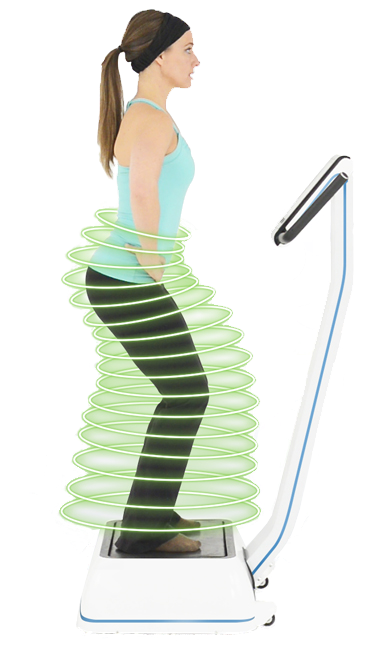 Whole Body Vibration creates an effect similar to the elevator moving upwards, it’s as if your body just became heavier. You feel this acceleration as a force on your body, a force called G-force which is adding to the force of gravity pulling you toward the Earth. Where conventional exercise has failed, researchers at the European Space Agency have successfully used Whole Body Vibration to completely prevent the degeneration in bone and muscle during prolonged weightlessness by using Whole Body Vibration. At this point it becomes important to distinguish between Vibration Training machines and Vibration Massage machines. In the European Space Agency experiments the most successful outcomes came from using a G-force of 15G 7. Reducing that to 10G resulted in partial success. Reducing to 5G or less reduced the effectiveness by 70-100% ie. if muscle, bone and body conditioning are your goals, using low G-force is ineffective for all but the most frail and deconditioned individuals. 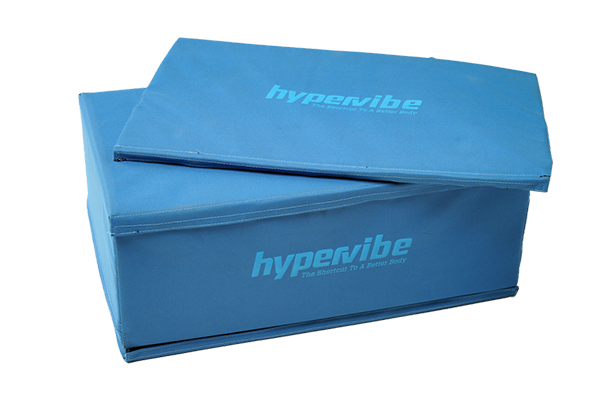 G-force is the most important factor when it comes to stimulating the body to improve with Whole Body Vibration. If you want maximum results with minimum time and effort your aim should be to use the highest G-forces you feel comfortable with. Read more and discuss value for money in How Much Should You Pay For A Vibration Machine?